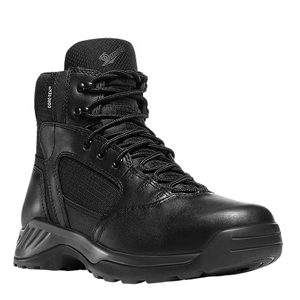 Police officers, Special Operations, Special Tactics Team Members and professionals in uniform that work in extreme conditions will be more prepared in the Kinetic GTX 6” Boots. With 100% waterproof Gore Tex and Polyurethane foot bed and midsole your feet will stay dry, warm and comfortable. Extreme weather or long work days call for extreme durability. These boots are built solid and long lasting with full-grain leather and rip stop ballistic nylon. Kinetic outsole will increase agility out on the field and provide superior traction. Also, their lightweight design will not hold you back when on the run. The Kinetic GTX Boots are available in a variety of sizes to accommodate smaller feet and some women.